Next time you decide to throw a party, consider having it outdoors. As the warmer months approach, it’s fun to take advantage of the nicer weather and dine al fresco with your favorite people. Whether you have a patio, screened-in porch, or a backyard pool, you’ll be able to enjoy some fresh air and a wide-open space as you mill about and chat with your guests. Keep a running list of everything you’ll need to do and check it off as you accomplish each task. Include your grocery list, beverage list, music, games, setup, and whatever else is needed for the party. Also have a guest list and put a mark by people's names when they accept or decline. Even for an informal outdoor party, it’s a good idea to send out some sort of invitation. It can be sent through snail mail, email, or even a phone call or text message. You’ll want to be specific with the date, time, and location where the party will be held. It also helps to request an RSVP so you know how many people to plan for. Planning a menu for an outdoor party doesn’t have to be a daunting task. Offer a buffet with a variety of food options such as vegan or gluten-free to make sure everyone can have something they enjoy. Another thing you may want to consider is having a potluck. It gives your guests an opportunity to share their best dishes. Have a way to keep hot foods hot and cold foods cold. Position the serving table near an electrical outlet for food warming trays. Place a shallow pan of ice beneath platters of items that need to be kept cold. The best hosts offer a variety of beverages to their guests. If you choose to serve alcohol, also provide some nonalcoholic options for those who choose not to imbibe or consume less alcohol. There is also nothing wrong with having a BYOB setup, since everyone has specific preferences. Put your beverage station in a different location from the food area. This can prevent a bottleneck when everyone is trying to get something to drink and eat. Have a cooler or ice chest filled with enough ice nearby. If you're using paper products, have at least one trash can available. Keep an eye on it and empty it before it starts to overflow. You'll also need a place for everyone to place their dishes and glassware after they are finished. This can be a table or plastic bin that you place in an out-of-the-way location. Provide plenty of seating for everyone. You can use a variety of seats from your patio set, lawn chairs, and folding chairs as long as they are in a secure position and on a level surface. Another option if the lawn is dry is to have blankets for those who are willing to sit on the ground. If you’re hosting an outdoor party during the day, have some places with shade so your guests can get out of the direct sun. This can be a patio with a roof, a tent, an awning, or an umbrella. 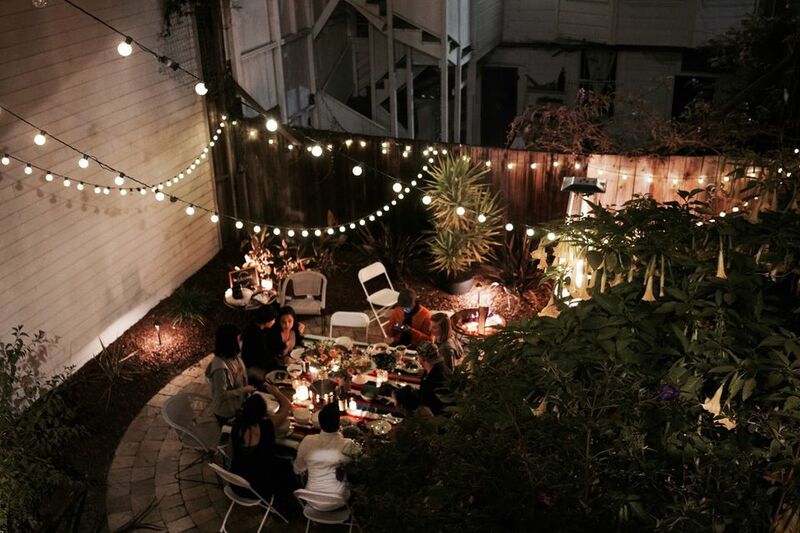 A nighttime outdoor party needs plenty of lighting. It doesn’t necessarily have to be bright as long as your guest can see well enough to move about and have conversations with others. Use string lights, lanterns, candles, and other lighting you may already have in your outdoor area. If you like colorful decorations, you can go all out at an outdoor party. Hang colorful lanterns, put up a piñata, and pull out your brightest tablecloths. Even your place settings can be as colorful as you want. Don’t be afraid to mix and match colors and textures as you decorate. Every party needs music, so work on your playlist based on the people you’ve invited. If a variety of generations are attending, offer music that spans the decades. Once you know who is attending your party, you’ll need to determine what activities they’ll enjoy. Some people may prefer quiet conversation and listening to music, while others will enjoy a game of charades. You may even want to have various areas set up for different interests. If children will be at your party, make sure you have plenty of activities lined up for them. Water sports and games are always fun because they keep the kids cool while they splash around. Make sure you arrange for enough adults to supervise the little ones. Outdoor parties can become quite noisy if you allow them to. If you know that your neighbors object for any reason, consider bringing the party indoors after a certain time. It’s also good form to invite the neighbors. If you do this, they’re not as likely to complain about the noise. As the weather heats up, the pests start swarming. There are several things you can do to keep the bugs at bay. Before the party, make sure there is no standing water in the area. Some well-placed fans will keep mosquitos and flies away from your guests and the food. Have some bug spray or repellent wipes available in case your guests continue to be bugged by flying pests. You can also use citronella candles to help with pest control. Don’t forget that bugs enjoy a good feast too. Cover the food with netting or a specially designed lid to keep the insects from getting into the dishes you worked so hard to make. Mow your lawn and trim your shrubs in the area where you plan to have your outdoor party. It’s best to do it the day before the party so it will still be fresh but you won’t be exhausted. You’ll also want to clean your outdoor furniture to make sure it is free from dirt, bugs, and mildew. Sometimes all it takes is a good hosing to knock off the dust that formed since you used it last. Even though you don’t plan for anyone to get hurt or have an accident, it’s always good to be prepared. Have a first aid kit at the ready, in case a bee stings someone or they fall and scrape their knees.